The Canadian Radio Research Lab (CRRL) is VA3ON's personal notebook on all things Amateur Radio in Canada. Opinions are my own and do not necessarily reflect those of my employers or organizations to which I belong. I’m re-reading Simon Sinek’s "Start with Why” (for a quick overview read www.startwithwhy.com ) because I'm trying to ground myself as I move forward as a Director in Radio Amateurs of Canada. 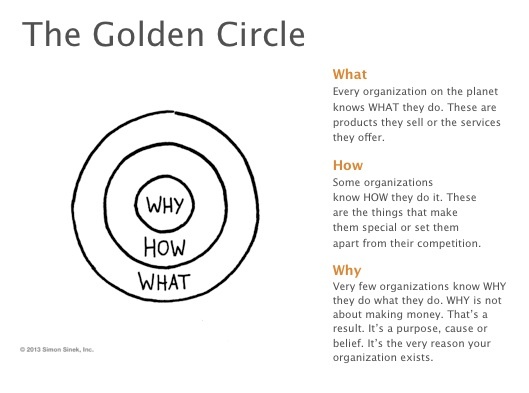 Sinek’s “Golden Circle” is a naturally occurring pattern, grounded in the biology of human decision making, that explains why we are inspired by some people, leaders, messages and organizations over others. As a Director, I need to define my priorities and these need to be consistent with my constituency here in Southern Ontario if I am to represent them, but there's a bigger, national requirement - RAC needs to define and communicate it’s purpose. It seems so simple, but until we do a better job of this, we cannot expect Canada’s Amateurs to support, let alone volunteer, with the organization and thereby make RAC the vibrant organization it needs to be.